Clean up, paint and photos by Paul Dempsey. Found in the Jim "Paw-Paw" Wilson tool collection, this nearly unsued little vise had aged until the paint and rust nearly matched in color. 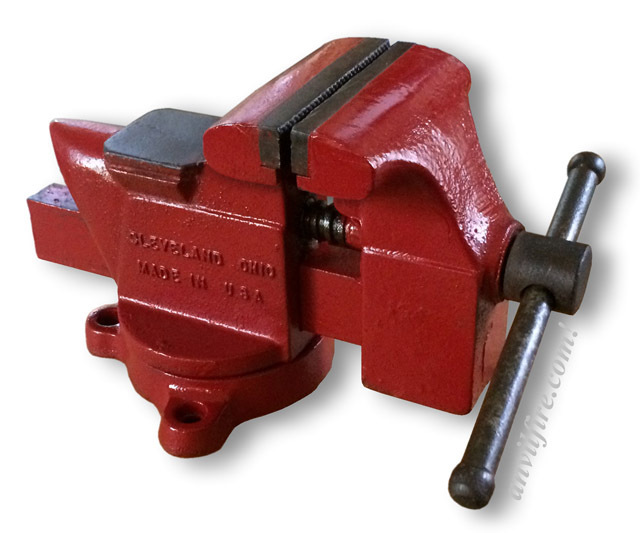 This size vise is one of the most popular in home shops and on benches where light work is done. Earlier models this size were much prettier with flowing lines and came with a small steel cutoff "hardy" that fitted in a drilled hole in the "anvil" section. Later models had zinc plated hardware (screw, handle and locking lever). This vise has replaceable steel jaws and the slide beam is carbon steel cast into the front jaw. Pipe jaws are part of the casting and not replaceable. The Columbian Hardware Company was established some time in the late 1800's and manufactured blacksmiths anvils and vises. In 1926 they reincorporated as the Columbian Vise & Manufacturing Co. and ceased making large anvils. The only anvils made from this point on were small bench or craft anvils. 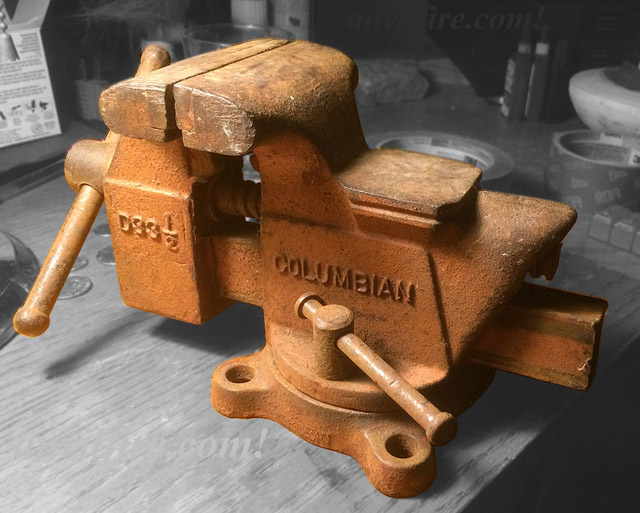 The Columbian Vise Company made vises until 1973 when Warren Tool Company purchased the Company. You will find some of these vises were sold at Sears under the Craftsman name with the Craftsman name in the casting. Weight: 12 lbs 13 oz.